Doug Behm has been sitting on a Jet Blue flight bound for Cartagena, Colombia, for hours. He shared a photo of passengers standing restlessly in the plane's center aisle. "Was supposed to leave at 7.51 AM," Behm tweeted. "Taxied for a while, then back to the gate to refuel. Delayed due to staffing issues caused by the Government shutdown." Nearly three hours after his flight was supposed to take off, Behm told CNN the plane was still stuck at the gate at John F. Kennedy Airport. "Haven't gotten an update in a while," he said. This expert is concerned some air traffic controllers are "not fit for duty"
Asked by CNN's Jim Sciutto whether the airport delays are a direct result of the government shutdown, Trish Gilbert, Executive Vice President of the National Air Traffic Controllers Association said, "Absolutely." "We predicted that you cannot continue to operate a system this complex for this long without the support structure of the people that are furloughed," Gilbert said. While Gilbert doesn't know the details of every absence, she said there are concerns that stress and a lack of sleep could mean some air traffic controllers aren't able to do their jobs. "We are already short-staffed," she said. "So now you've added the stress to air traffic controllers and their personal circumstances. And they're not sleeping at night. Now we're concerned that they're not fit for duty." White House Press Secretary Sarah Sanders said in statement that President Trump has been briefed on the airport delays. "The President has been briefed and we are monitoring the ongoing delays at some airports," Sanders said. "We are in regular contact with officials at the Department of Transportation and the FAA." 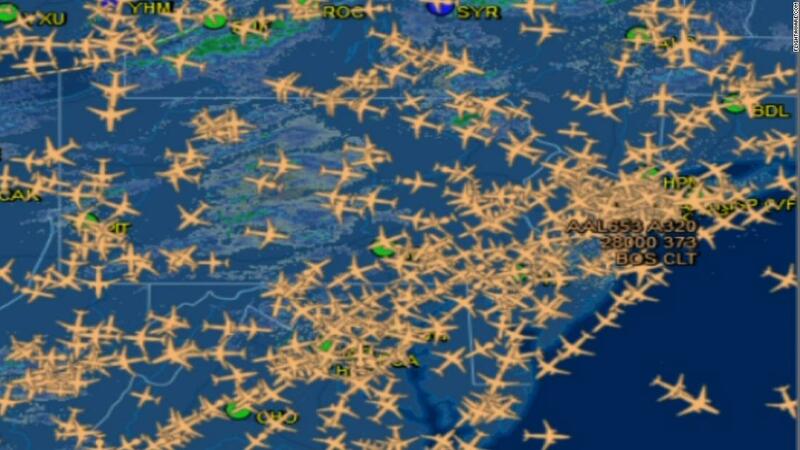 It’s too early to say whether widespread flight delays at major East Coast airports will break the shutdown stalemate. But the prospect of a national air travel meltdown has long loomed in the minds of White House and congressional officials as the one thing that might bring an end to the stalemate. As the shutdown has worn on, Trump has been focused on two particular areas where Americans might be affected, according to people familiar with this thinking: Air travel and tax returns. There is a ground stop at New York City's LaGuardia Airport right now. The ground stop will go on for about another hour, according to an FAA spokesman. The ground stop was ordered as a way to clear congestion caused by the staffing issues and the resulting slowdown of traffic. Philadelphia International Airport tweeted that the FAA is reporting departure delays of 1 hour and 14 minutes. Joy Burney is sitting on Delta flight 2927, from Atlanta to New York City's LaGuardia Airport. That flight has been delayed because of staffing issues with air traffic control. "My flight was supposed to take off at 9:30," she told CNN. "(Our) departure time was updated 3 times. Originally, we were told there was a delay at LaGuardia. They thought maybe they were de-icing planes since planes were grounded." FAA: We're experiencing "a slight increase in sick leave"
"We have experienced a slight increase in sick leave at two air traffic control facilities affecting New York and Florida. As with severe storms, we will adjust operations to a safe rate to match available controller resources. We’ve mitigated the impact by augmenting staffing, rerouting traffic, and increasing spacing between aircraft as needed. The results have been minimal impacts to efficiency while maintaining consistent levels of safety in the national airspace system." It added that travelers can monitor air traffic here, and check with airline carriers. Air traffic is delayed at LaGuardia, Philadelphia, and Newark airports due to staffing issues at an FAA regional air traffic control center, according to the FAA status website. Flights into Philadelphia, La Guardia and Newark airports are delayed by an average of 41 minutes. LaGuardia departures delayed between 15 minutes and 30 minutes.